Skateboarding involves riding on a specifically designed four-wheeled wooden board. It currently draws an estimated 12.5 million riders worldwide. The sport emerged in California during the 1950s as an offshoot of surfing, and was originally known as "sidewalk surfing." Skateboarding went mainstream in the mid 1960s when surfboard manufacturers such as Hobie and Makata started to build skateboards resembling small surfboards. They also assembled teams to promote their products. By 1965, international championships were being broadcast on national television. Between 1966 and the early 1970s, popularity of the sport had dropped off, but it was revitalized again by skaters such as the "Z Boys," who invented vertical skating in swimming pools left dry from the California drought of 1976. Anna Hopkins. Fox News. Tuesday, 16 Apr 2019 17:45:21 GMT. ABC News. Monday, 15 Apr 2019 09:59:41 -0400. A skateboard consists of four wheels attached to two axles called trucks. The trucks are mounted to the bottom of a wooden board called a deck. Skateboard decks are usually made of seven layers of pressed Canadian maple veneer; these decks measure 31 inches long and 8 inches wide, featuring a rise at both ends. The front rise is called a kicknose; the back a kicktail. The kicknose and kicktail provide leverage for boarders to perform tricks. The deck is usually topped with abrasive grip tape for traction. A truck is made of a base plate mounted to the deck and a hanger housing the axle. They are mounted 13 to 15 inches apart and made of lightweight aluminum, allowing the riders to shift weight and turn the skateboard. The urethane wheels on a skateboard are 50 to 65 mm in diameter and 65 mm wide. Protective equipment includes kneepads, elbow pads, wrist guards, gloves, and a helmet. 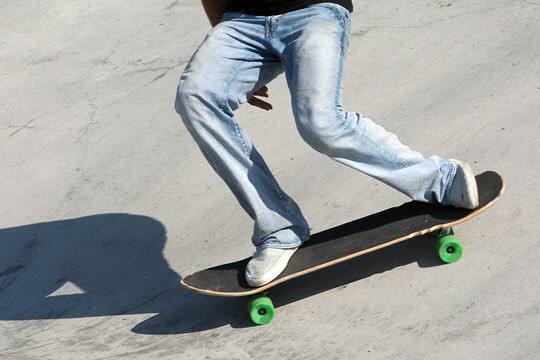 When riding, both feet are shoulder-width apart on the board. The rider may keep the front foot on the board while using the rear foot to push off the ground for increased speed. The board is turned by shifting body weight between toe and heel. A wheelie is performed by placing weight on the kicktail, and a kick turn is performed while rotating the board during a wheelie. 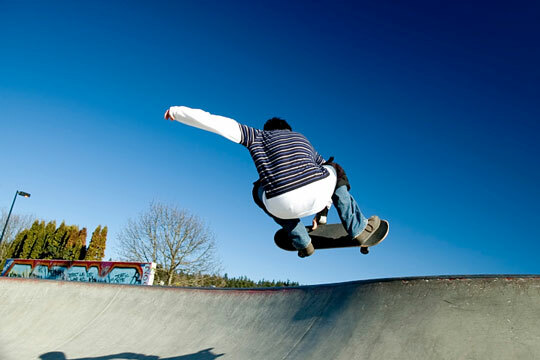 Aerials are advanced maneuvers performed by grabbing the side of the skateboard in the air after launching off a ramp or similar object. 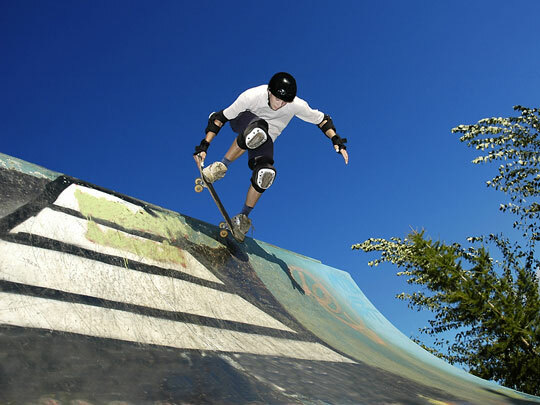 An ollie is an aerial stunt in which the skater does not grab the board while in flight. When the skater lands back on the board after it has flipped one or more times while airborne, this is called a board flip. A grind is performed when one or more trucks is directed onto a curb, railing, pipe, or similar object, and the rider "rides" this object along the edge. 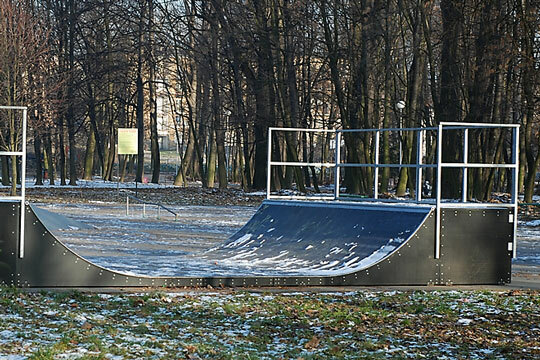 Many cities have skate parks which provide an enclosed environment with ramps, ledges, stairs, and half pipes for skaters to practice their tricks. Half-pipes are shaped like a trough, and allow riders to practice vertical, or "vert" skating. In vert skating, riders perform aerial tricks on each end of the pipe, as well as hand plants, foot plants, and flips. Skateboarding competitions include freestyle, street, and vert categories. In freestyle competition, the skater must perform stunts and tricks on a flat surface. 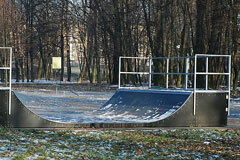 Curbs, benches, stairs, handrails, boxes, and ramps are used in street competition. Large half pipes or empty swimming pools are used in vert competition. Some competitions also include slalom racing, in which skaters must maneuver through an obstacle course.